The big game is upon us once again. All across Rock Hill on the evening of February 3rd, crowds will gather to watch a series of fantastic commercials interrupted by large men playing football. Regardless of which team those crowds will be rooting for, something everyone can agree on is the need for easy and delicious game-day grub. If you’re hosting the party or if you want to be the guest that brings the super bowl of food, you’ll want to try out these Spicy & Sweet Dr Pepper Meatballs. One of the best things about this recipe is the ease. No matter your level of cooking comfort, there’s an option for you. These different options will be presented in order of easiest but longest to slightly more hands on but quickest. The easiest option for making these Dr Pepper Meatballs involves a slow-cooker and time. Simply dump all your ingredients into the slow-cooker, then walk away. After a few hours, your meatballs will be ready for your game day crowd. The hardest part about making these meatballs is the little bit of prep time for the ingredients. To make the game day cooking a little bit easier, assemble the glaze the night before. Mix all the ingredients in a bowl, cover tightly, then place it in the refrigerator. The next day, you can follow the steps listed above. Here you trade ease for speed. Sure, dropping everything in a slow cooker and waiting is easy, but it takes hours. This method is a little more hands on, but can be done just before the guests arrive. Following the directions on the meatballs, cook them in the oven. While the meatballs cook, make the glaze on the stovetop. Place all the glaze ingredients into a medium saucepan over medium heat. Cook the glaze, stirring frequently, until it becomes slightly thickened. You can speed up this thickening by adding a 1 tbs cornstarch mixed with cool water to the mixture before heating it. 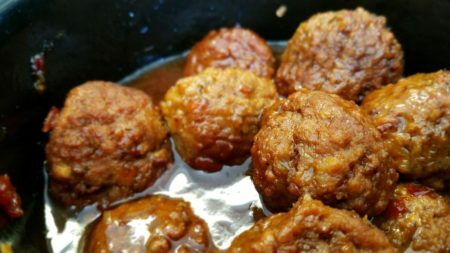 When the meatballs come out of the oven, place them into a heavy serving dish and toss them with the glaze. Click here and here and here for more gameday crowd pleasing recipes.